Living in NYC teaches one a whole lot about buildings. Without even trying to learn these things, I now know which war to which a prewar building refers, and exactly why they're coveted. I know why one should never attempt to hang a large antique mirror in new construction (a.k.a nearly anything not prewar) without professional help. I know that a six floor walk up is amazing for the bum, and terrible for pests who who can't quite make it all the way up. I know why most rental apartments have hardwood flooring instead of seemingly cheaper options, and how steam heat snakes through a building. What causes banging pipes, and exactly when and why one should bang on her heating pipes. But of all these things, the very first thing I learned when I moved into my very first apartment was to recognize when there is a necessity to use wall anchors, and the importance of knowing what type of wall one has so that she can select the correct anchor. Let me start by saying that I am not an expert in this field -- what I've learned has been from many super helpful men at many hardware stores who, over the years, have taught me the basics. I hope to explain enough here to give Meaghan and anyone else enough knowledge to not feel silly when heading to a hardware store, but do ask for recommendations -- the people who work at small (non-chain) hardware stores are some of the most helpful people I've ever met, and are nearly always excited to share their expertise… As long as one is willing to listen. At the absolute most basic level, there are two types of anchors: Anchors for solid walls, and anchors for hollow walls. Clearly, knowing if the wall is solid or hollow is the very first step. For hollow walls, one must determine if she is about to hang something into the hollow part or the stud (the 2x4's that frame the wall). When I hung this project, I had to use different anchors for the hollow areas and the studs. There are fancy tools available to light up or beep over studs, but if all else fails, knock an awl into the wall, and see how far in it goes. 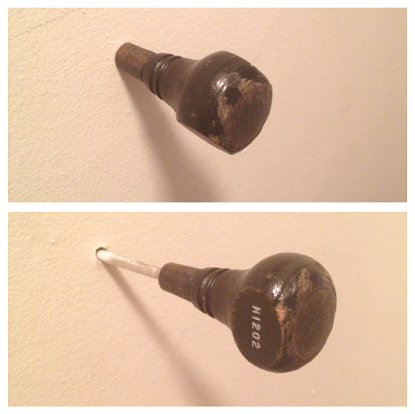 At left, the top picture shows a hollow portion of the wall, where the awl is easily pushed all the way in, and the bottom picture shows where the awl hit the stud, and will not go further without serious effort. These are the fun ones! Like wings, they go into the hole and open up. Once open, they cannot fit back through the hole they entered, so they draw their strength from pushing up against the inside of the wall. A metal one is shown in the top picture at right. The big thing to know here is the weight of the item being hung, as it determines whether the anchor needs to be for a lightweight item or a medium/heavyweight item. These guys expand, ripping apart at their seams as a screw goes into them. They kinda create a wedge between the screw and the wall, so that the screw won't easily pull back out while holding weight. A plastic one is shown in the bottom picture at right. Besides knowing the weight of the item being hung, this is where knowing what type of wall one has becomes important. For brick, concrete, or cement like Meaghan's, one must use a special masonry drill bit to drill into the wall -- don't even try to use an awl. Remember to blow out the dust created in the hole (very important! Also, safety glasses help with this), and then use an expansion anchor. For hanging pictures, I've been fine using plastic anchors, but something very heavy like a TV or large antique frame will need more attention, and I know I wouldn't attempt it on my own. How to insert the anchor is something the experts at the hardware stores always assume one knows. It's not complicated, but not knowing can create a headache. For hollow wall anchors, a tight (or pilot) hole is made, and the anchor and the item being hung must then go into the hole together. This is because once the wings open up, the bolt cannot be removed from the wall. The beginning of this process is shown in the top picture at right, where the anchor is attached to the wood, but not yet far enough onto the bolt or inserted into the hole on the wall. For solid wall anchors, the anchor goes into the wall on its own. 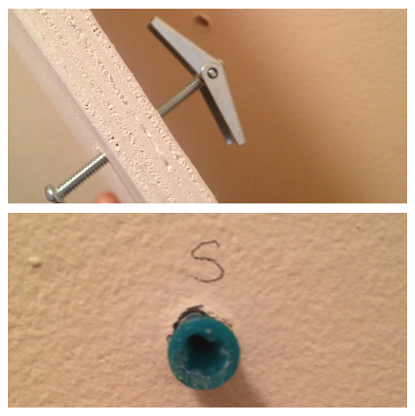 A tight (or pilot) hole is made, then the anchor is tapped with a hammer to get it flush with the wall. 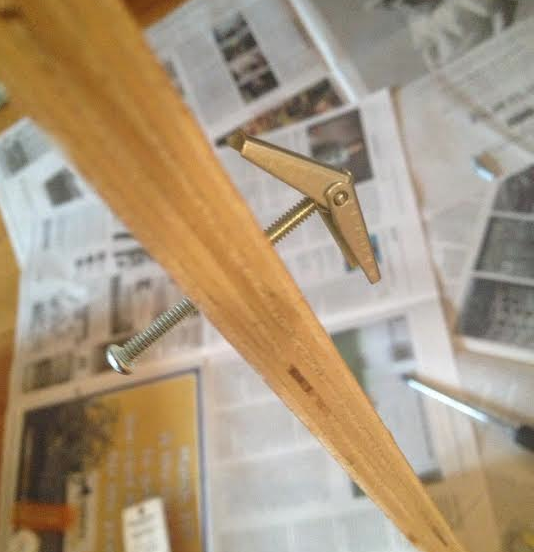 The nail and the hanging item are then added separately. This is shown in the bottom picture at right. No matter the type of anchor, when creating the tight pilot holes, the size is really important. Too big, and the anchor has only air to expand into, but too small, and the anchor won't fit into the hole. If using a drill bit, the size will be listed, but if using an awl, start small and gradually increase the diameter of the hole until the correct size is created. Knowing the type of wall and the weight of the item hanging is the top priority. Without this information, even someone willing to help will only be able to give a guess, but with this information, a helpful person at the hardware store can make using anchors feel as easy as banging in nails.